The department is supremely egalitarian: assistant professors can serve on any committee and vote on any issue but tenure cases. Graduate students are also present at all of our faculty meetings and have two votes. A pair of undergrad representatives also attend. We are the friendliest and most collaborative department ever. Instead of quals, our grad students do synthesis research projects that must include two professors across areas. These often result in publications, grants, and long-term collaborations. 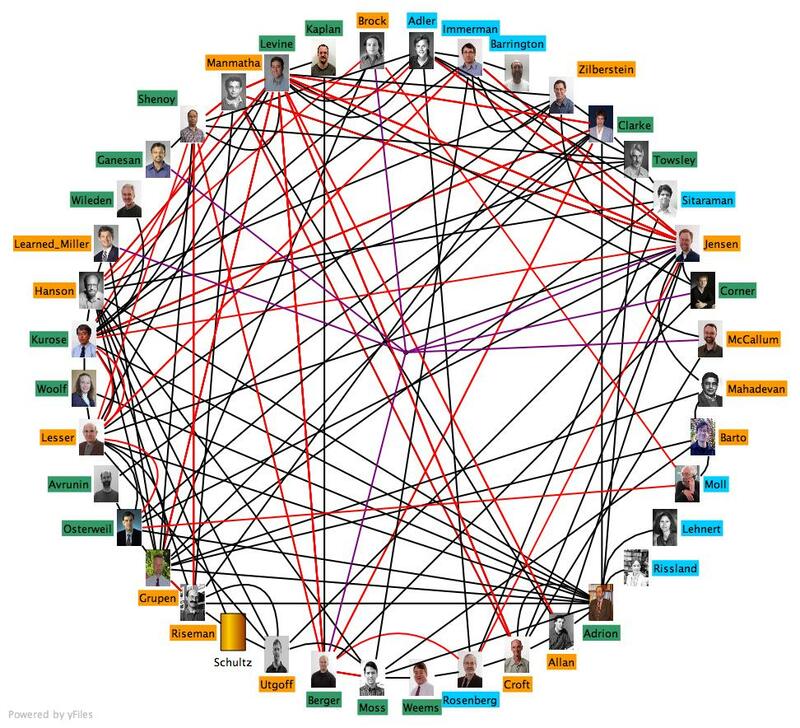 Click on the graph: each line is a collaboration between a pair of faculty members. There are lots of lines. The area -- Amherst/Northampton -- is beautiful, cosmopolitan, and liberal (and cited as #1 of the top 5 college towns in the USA!). We are in the midst of a sea of some of the top academic institutions in the world: Amherst College, Hampshire College, Smith College, and Mount Holyoke College -- together with UMass, these are The Five Colleges. The surrounding area is gorgeous (woods and hills, not far from the Berkshires). It's the bluest city in the bluest state in America, with the highest percentage of voters for Kerry of any city in America (tied with Cambridge), and almost the highest percentage for Obama (86.5% — more than NYC). The area is also full of educated folks: 42% have graduate degrees — nearly the highest in America. The restaurant scene is unusually strong. Thai, African, serious Chinese (the owners run an organic Chinese vegetable farm, which is the source of their numerous vegetable dishes), the best ice cream known to man (including a shop run by Steve Herrell, the guy who invented the gourmet ice cream biz, as well as mixins, and Flayvors, which makes their ice cream from milk from their own cows! ), French, Indian, Korean, Mexican, Argentinean, Moroccan, Tibetan, Vietnamese, plus a ridiculous (the New York Times says "unsustainable") number of sushi restaurants. Great college town means great coffee shops! Rao's (which roasts its own), Esselon (ditto), Amherst Coffee, Haymarket Cafe, The Roost (coffee from Ithaca's Gimme Coffee), and the Woodstar Cafe. The culture part: the presence of a large university, four major colleges, plus institutions like the National Yiddish Book Center means there is a wealth of cultural activity of every stripe: art, music, theater, and fascinating speakers. The educated crowd also supports the presence of three art cinemas, two in Northampton just down the road, and a newly renovated one right in downtown Amherst. And the best local bookstore in the world!, according to the L.A. Times: the splendid Montague Bookmill. Finally, does your school have a (NSFW) rocking theme song by the Pixies? I didn't think so.